Google Maps for Android has been updated to version 6.0 that brings indoor Maps that lets you determine where you are, what floor you’re on, and where to go indoors and more. It also includes detailed floor plans that automatically appear when you’re viewing the map and zoomed-in on a building where indoor map data is available. It also has a new drop-down menu for the top toolbar for easy switching between common features and updated home screen for places. 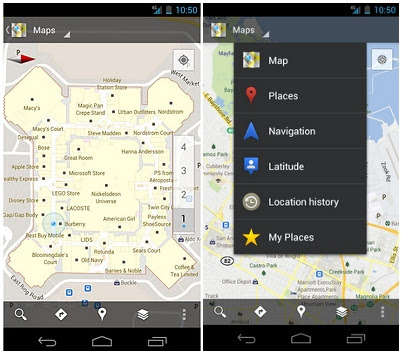 Download Google Maps v6.0 for Android from the Android Market for free. The Indoor maps are currently available in selected locations in the U.S. and Japan. More indoor maps to public buildings would be added in coming months across the world.